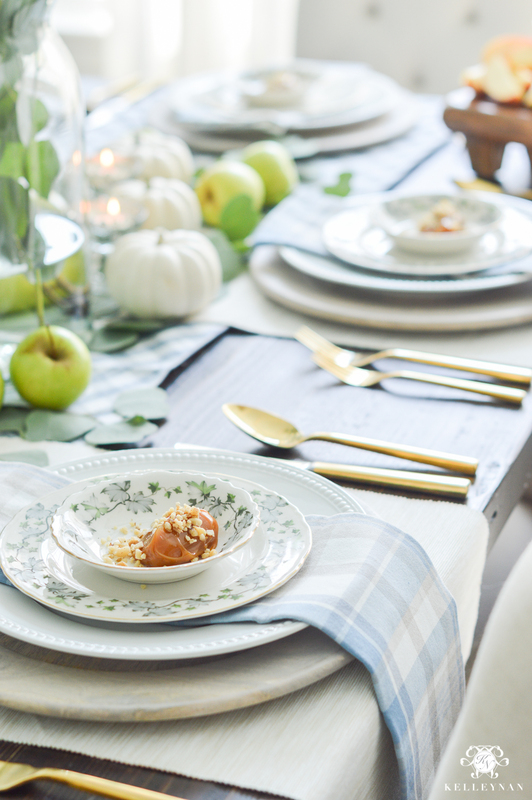 This easy fall table idea – caramel apple place settings – can be pulled off with only a few dollars and a quick trip to the grocery store. 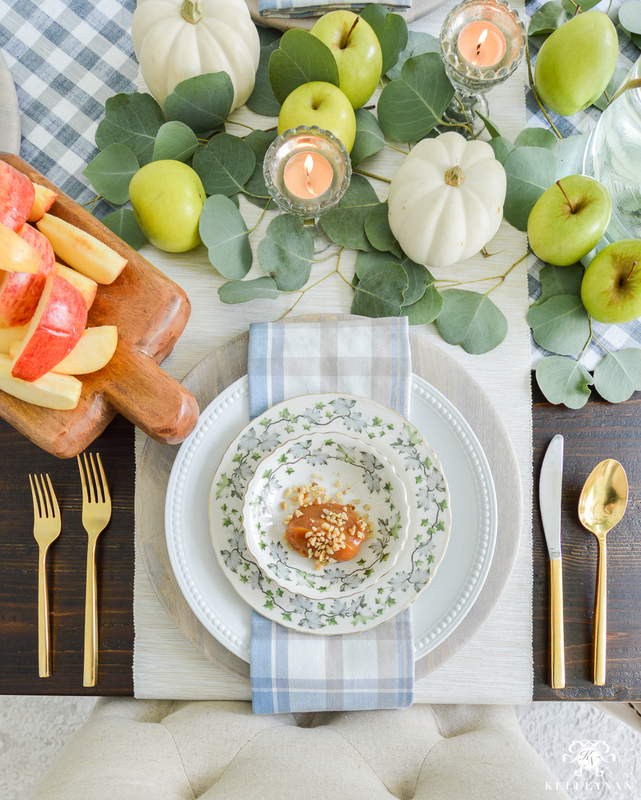 If you’re looking for a simple tablescape for your autumn entertaining, grab a few apples, eucalyptus, walnuts and caramel dip and you’re set! *Posts and pages on KelleyNan.com may contain affiliate links | Read the full disclosure HERE. I had zero plans of actually setting a table before the tour. Things just kind of fell into place and with my wheels spinning, it turned out to be one of the most simple tables ever. I’ll explain how the entire concept came to be. 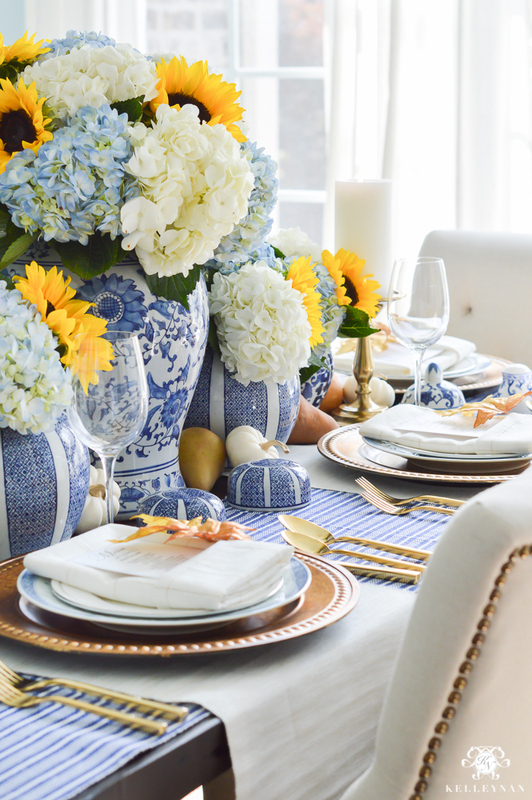 I was at Pier 1 when they were having a sale on their table linens (I always love their napkins). I found these blue and gray plaid cuties (HERE). A few days later, I saw a blue and gray gingham table runner at HomeGoods (always when you aren’t looking 😉 and I remembered my latest napkins- they coordinated beautifully. I purchased and added them to my entertaining arsenal. 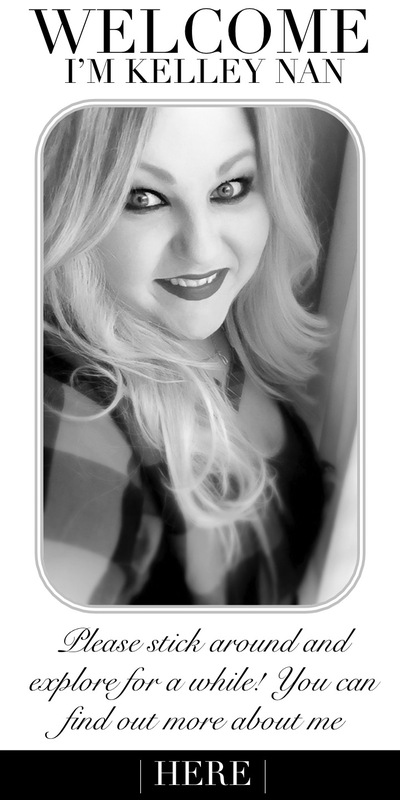 Pale blue isn’t typical for fall but, anything plaid sends me straight to that pumpkin-farm-state-of-mind. I decided that green apples would go nicely with the cool blues and grays and that I would work in some green eucalyptus and a few white baby pumpkins. 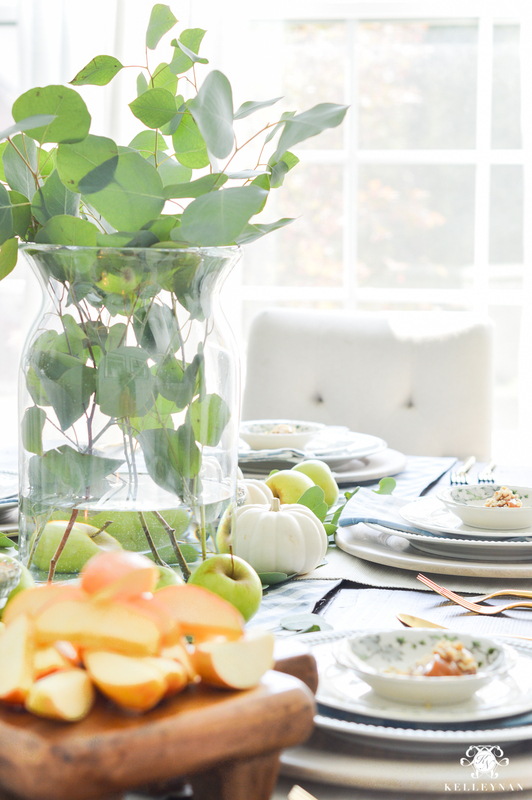 I actually had every intention of assembling a simple leafy garland going down the gingham runner (and sticking to only that), but when I finished, I decided to add my signature tall centerpiece, too, for some height. Seriously, y’all, I just took a few sprigs of eucalyptus and pulled them apart and spread them on the table. Then, I took a bag of small green apples and scattered them on top, mixing in a few white pumpkins. Lastly, I added a few of these small votives. That’s it. 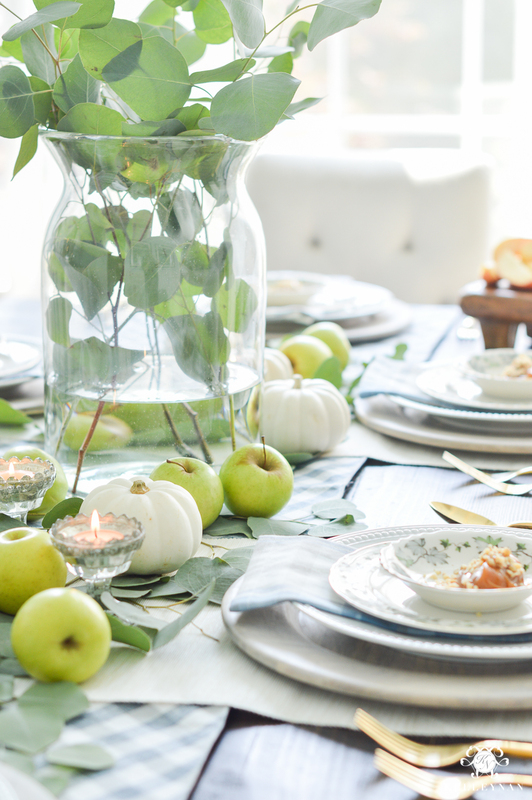 For the place settings, I knew I wanted to use my whitewashed driftwood chargers (HERE) and would layer in some basics on top. These chargers have quickly become my favs- I use them for any occasion from the most casual to more dressed up parties. 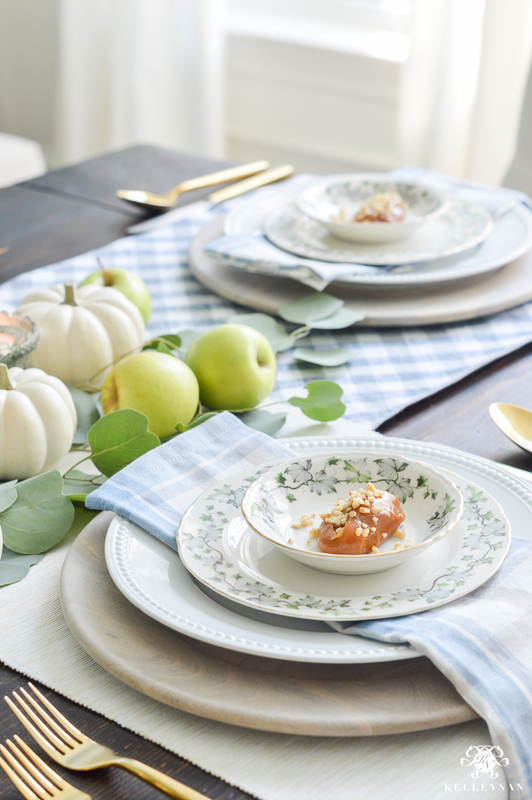 I actually used my simple everyday white beaded plates as the dinner plates but then remembered the little vintage china ivy additions my mom had gifted me a few years ago. 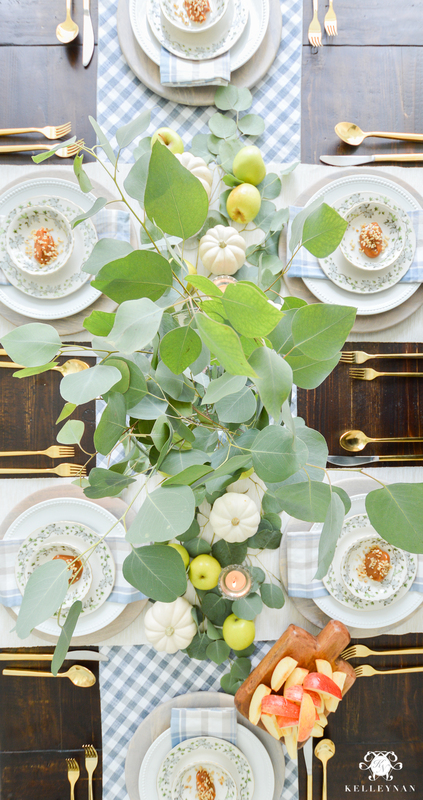 With a touch of blue, how perfect are they to compliment the eucalyptus and plaid? Had I not had them, I absolutely could have stuck with just the casual everyday set. 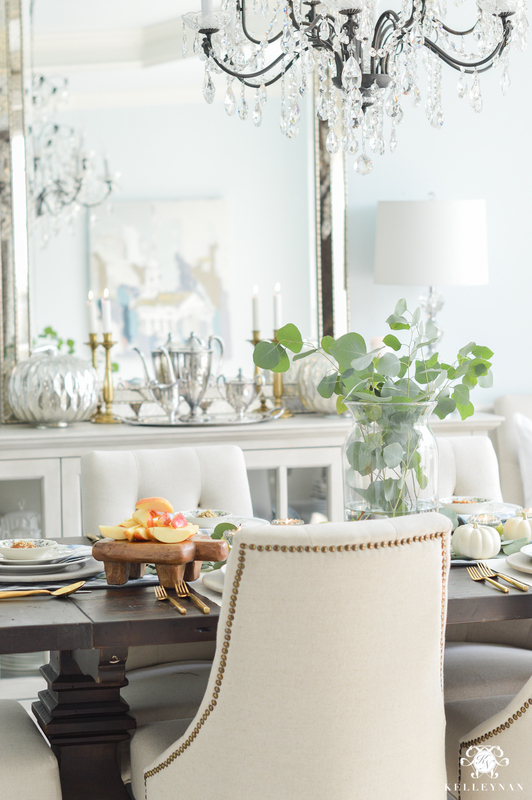 Somethin you may have noticed about me – I am more than ok mixing fine china with everyday ware. My gold flatware is pretty much a given these days. (It’s also 25% off right now HERE😉 ). 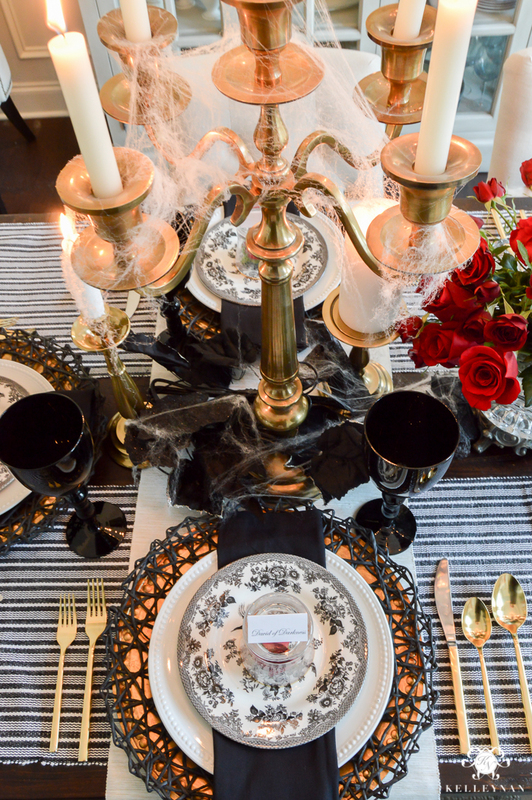 When I have most everything in place, I always like to determine the “special goodie” at each place setting. My go-to is a simple, folded place card. 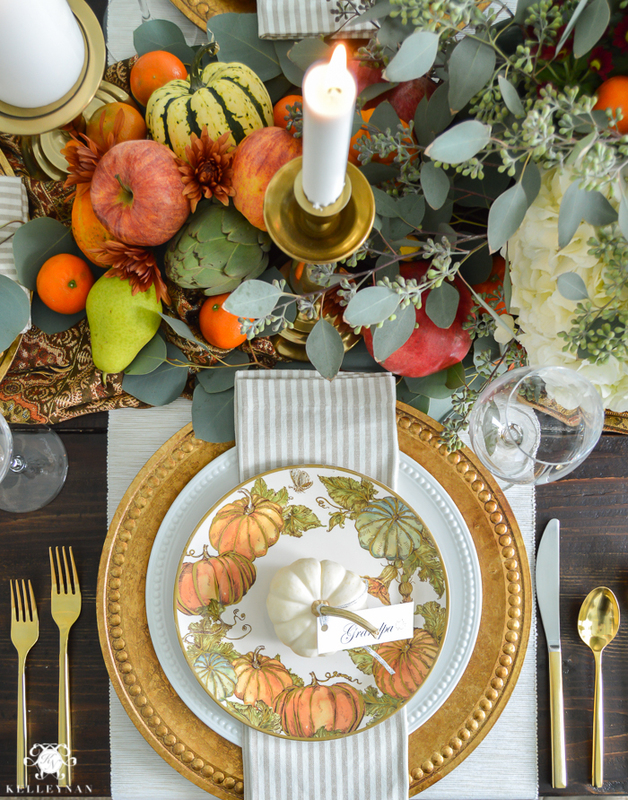 For fall, I’ve use small pumpkins in the past, leaves, menus, etc. 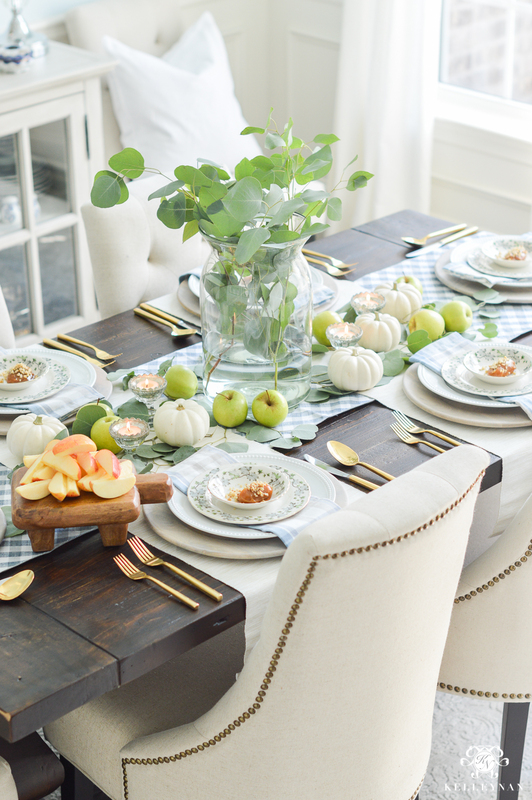 I ultimately decided that if apples were going to be the focus of this fall harvest table, why not take it all the way? 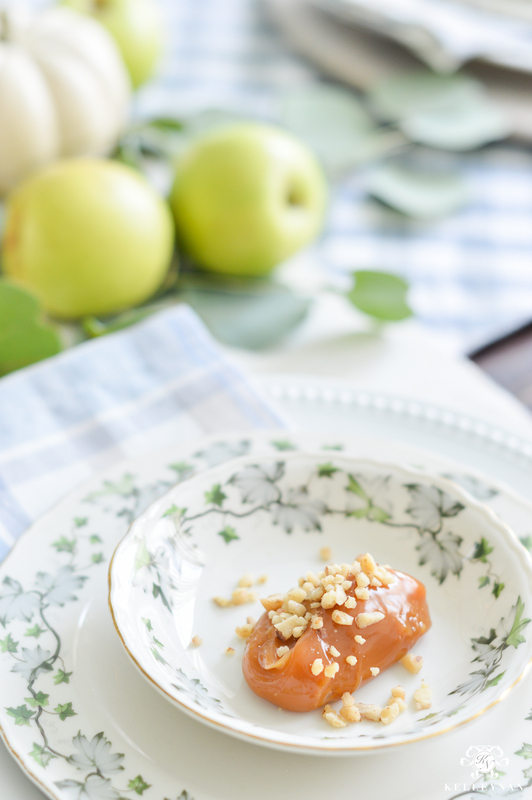 I decided to give each person their own personal portion of caramel, topped with chopped walnuts, for a caramel apple appetizer. 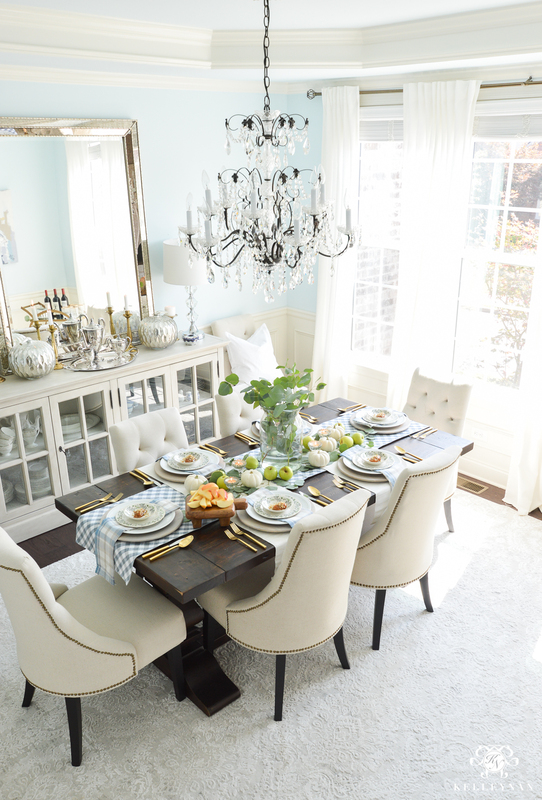 Remember the veggie dip I had in tasting spoons for my Easter table (HERE)? Same concept and I love how they turned out. After cutting passable apple slices, I shook them in a bag of lemon juice to keep them from browning. This wooden paddle board is no longer available in the mini but I have two medium sized boards I use all the time (HERE). Actually, you can see how I last use two mediums, together, as a centerpiece HERE. There is no rhyme or reason to the “scattering” of produce and foliage. 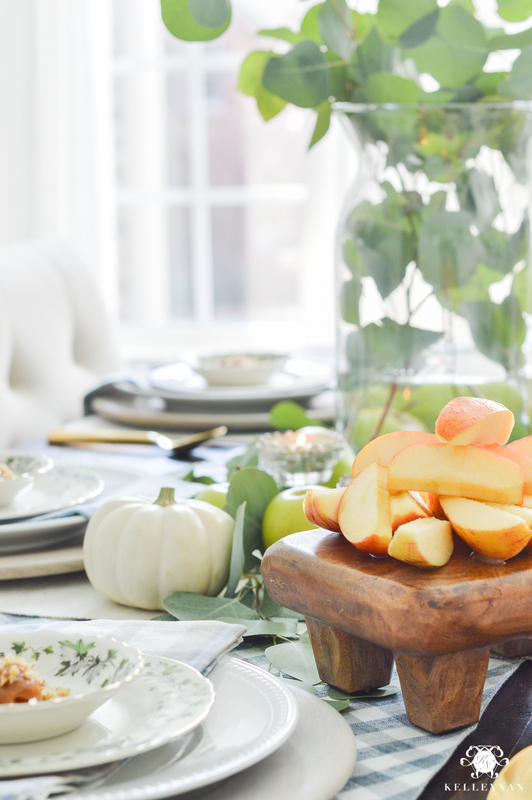 Throw it all on the table and then evaluate if one side looks unbalanced but the more imperfect it is, the more “natural orchard” vibe you will have. 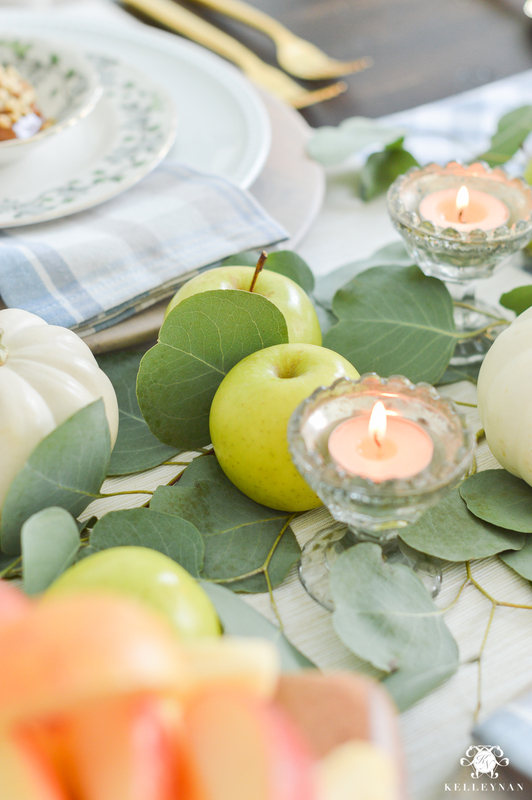 While the green centerpiece apples are smaller, the cut Gala apple slices are regular sized. 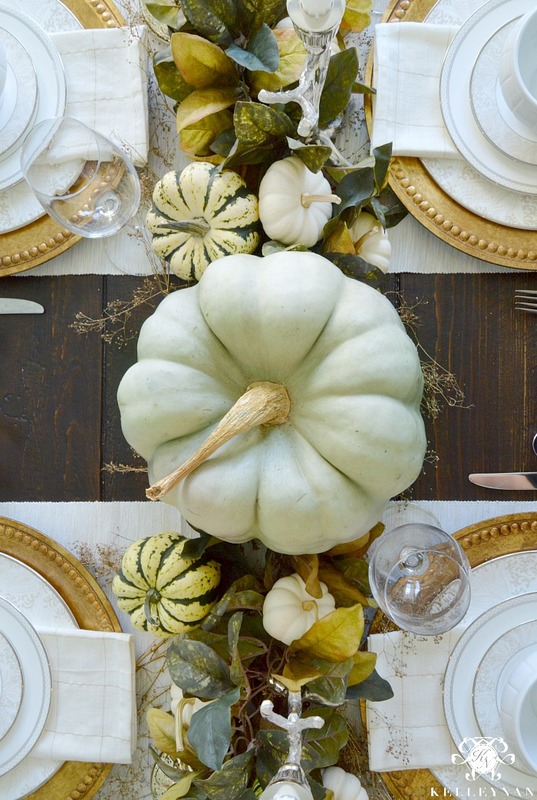 You could totally use the same kind of apple for the centerpiece and consumption but I decided to let my passable apps stand out just a little. 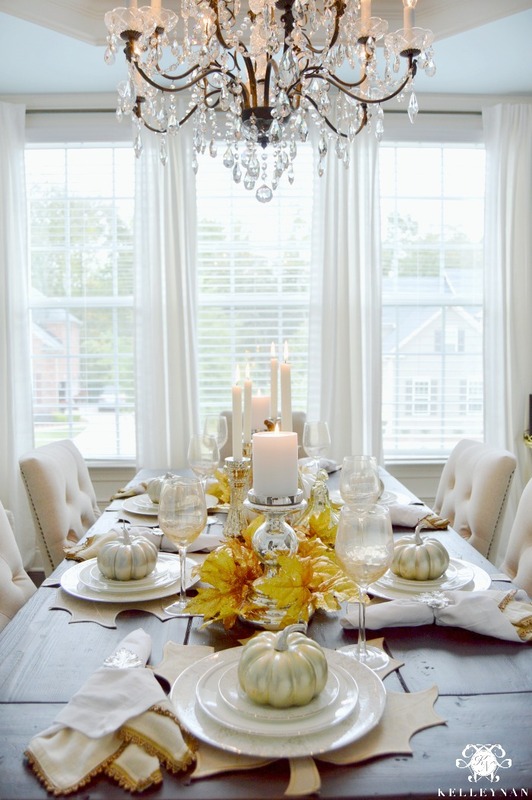 For other table ideas for the season, you can visit these previous fall setups. 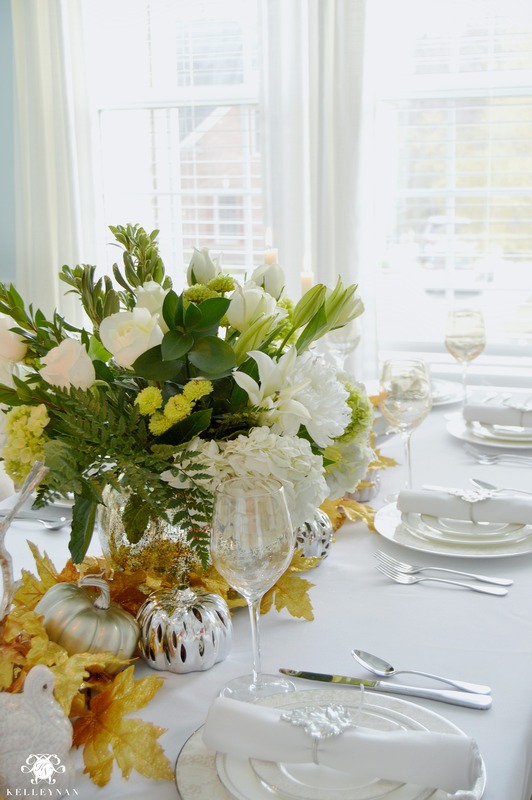 What a gorgeous table setting Kelley. 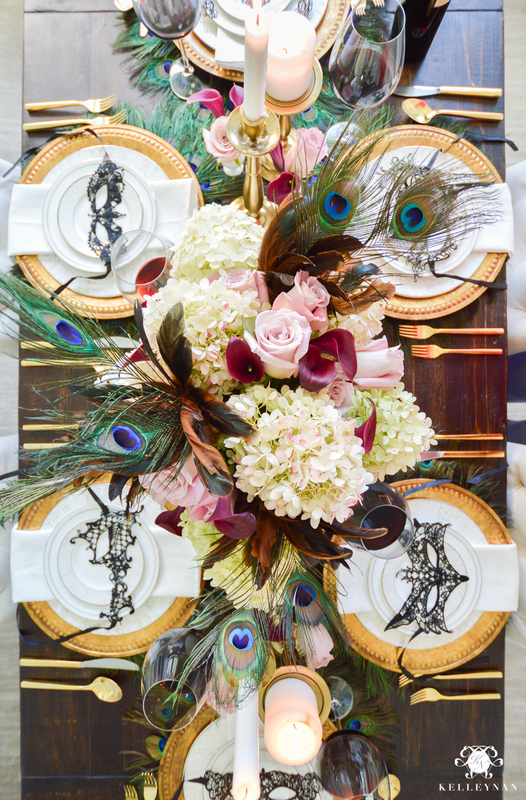 Love the untraditional color palette and the appetizer idea. I so love this! 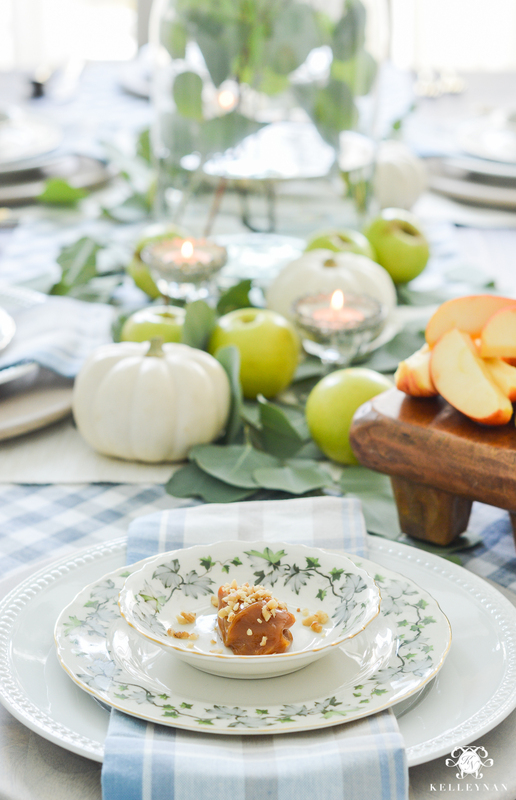 The plaid, the apples, the cheese boards, the caramel… Every bit is so good. I am so happy you found another use for the ivy dishes. Love your ‘scrapes at the end! I’m having real problems easily reading the text on your site. Perhaps you could make your type a bit bolder? Yours is the only blog I read that I have any issues with. I doublt if I’m the only one having this problem. Thanks for considering this as I love to read it!